This sparkly handmade Christmas ornament is a great way to reuse old buttons you probably have skittering around a junk drawer. You’ll find wooden snowflake shapes at most stores selling craft and hobby supplies. It's a fun holiday project for adults and older kids (buttons can be hard for small fingers to handle, and they're a choking hazard). 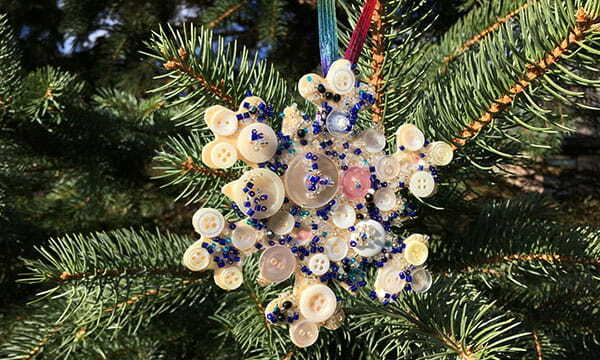 To make this ornament, you need white craft glue that dries clear, a foam brush, ribbon, buttons, and sparkly bits—glass beads, sequins, or glitter. I used beads because that's what I had on hand. Tie a ribbon around one of the snowflake tips. Knot it in back and make a hanging loop. Note: you can paint the snowflake first. I did not, but the back will look nicer painted white. Use a brush to thickly coat one side of the wooden snowflake with Mod Podge. Lay the snowflake on top of something to raise it off the surface (I used a small box). Place buttons on the snowflake. Then sprinkle beads in the open spaces, covering as much of the glue as you can. I like white, silver, clear, and blue beads because they're more snowflakey. To keep beads from scattering all over the place, put the ornament in a container to catch the spillage. Let dry, then gently shake off loose beads. That’s it! An easy, pretty Christmas tree ornament you can make in about 20 minutes. Looking for more holiday ideas? Check out some of our staff's treasured Christmas traditions.